Congo Gorilla Trekking Tours – The Democratic Republic Of Congo is one of 3 countries in the world where you can see the mountain gorillas in their habitat. 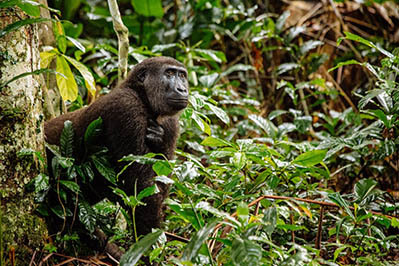 Congo however has both the Mountain and Lowland Gorillas making it unique as compared to Uganda and Rwanda the other two gorilla tracking destinations. While planning your Congo gorilla tour, there are two destinations to consider i.e Virunga National Park for the mountain Gorillas or Kahuzi Biega national Park for the lowland gorillas. You may consider tracking both the lowland and mountain gorillas also available in our packages. The Congo gorilla trekking permits cost $400 buts other costs and high lodge prices make the congo Gorilla trekking safari price difference with Uganda and Rwanda minimal. While on your Congo gorilla trekking expedition, one of our most recommended add-on activity is hiking mountain Nyiragongo. Climbing Nriyagongo is a very exciting and intressting activity which takes 2 days with a night spent at the top of the mountain. The view from the top of Nyiragongo is very impressive, it’s the ultimate dream for every mountaineer. We have several gorilla trekking packages in Congo ranging from short 2 day congo gorilla treks to multi day gorilla trekking, Nyiragongo hiking and wildlife safari packages.